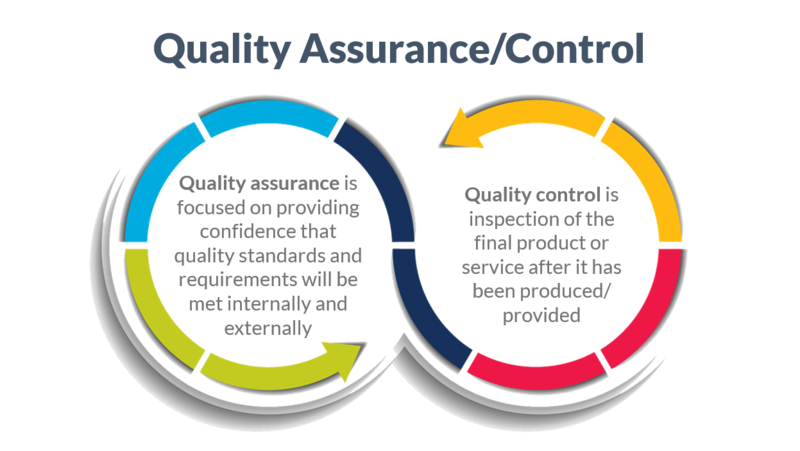 Quality management is a discipline for ensuring that organisational processes, procedures, systems and practices are fit for purpose and able to deliver consistent and continuous benefits. 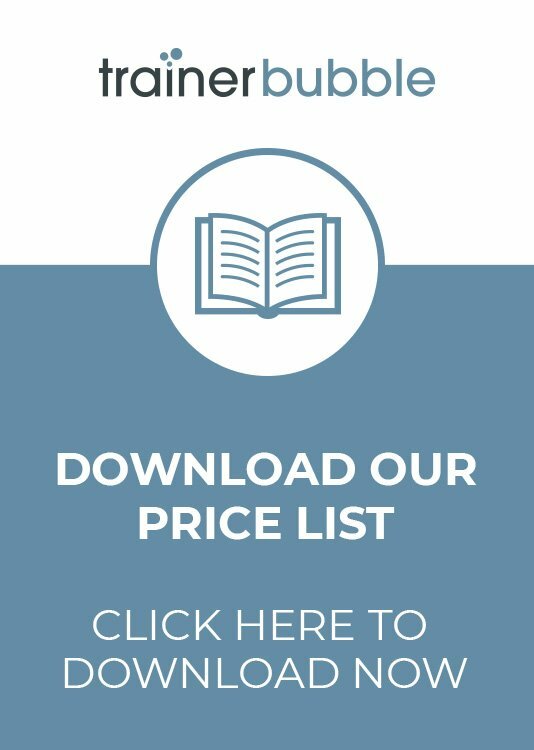 These Quality Management training course materials are aimed at participants that would benefit from implementing quality management principles within their organisation with an aim to improve the working practices of the business and consequently its success. The history of Quality Management, from a simple process of inspecting a sample of the finished product to Total Quality Management, has led to the development of essential processes, ideas, tools, and techniques that are central to organisational development, change management, and the performance improvements that are generally desired for individuals, teams and organisations. 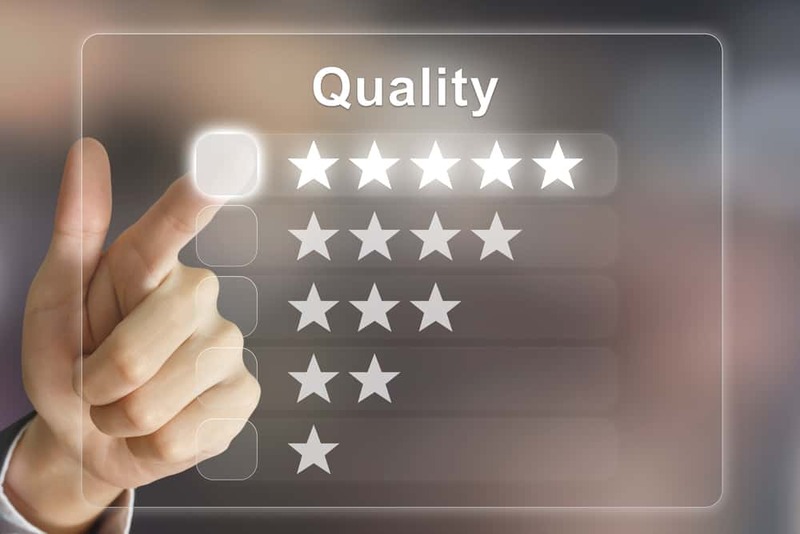 Businesses that do not focus on quality will quickly find that there are costs to be paid and the reputation of a business will quickly deteriorate as a result of poor quality. These training course materials aim to give your participants an understanding of the key principles of quality management and how to apply it to their own working practices. What is quality? Quality is defined by the customer. A quality product or service is one that meets customer requirements. The most successful organisations are those that give customers what they want. Satisfied customers are loyal to companies they feel best understand their requirements. As a result, they will make repeat purchases, and will recommend the business to their friends. These training course materials aim to raise this awareness in your participants, giving them the tools they need to succeed. Introduction, Objectives and Expectations – An introduction to the subject, an opportunity to review the course objectives and identify any personal objectives and expectations of the group. Includes a review of quality from a personal perspective. Background to Quality Management – Identifying key events in the development of quality management, which helps to give a broader understanding of the topic and its place within organisational development. 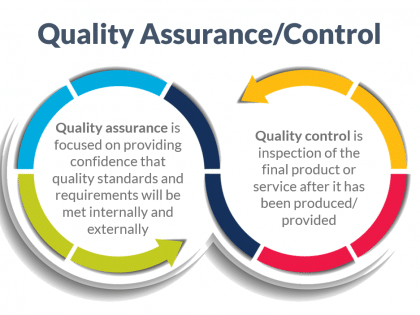 Quality Management Systems – Gathering an understanding of the different types of quality management systems, including; Total Quality Management, ISO 9001 and Kaizen. 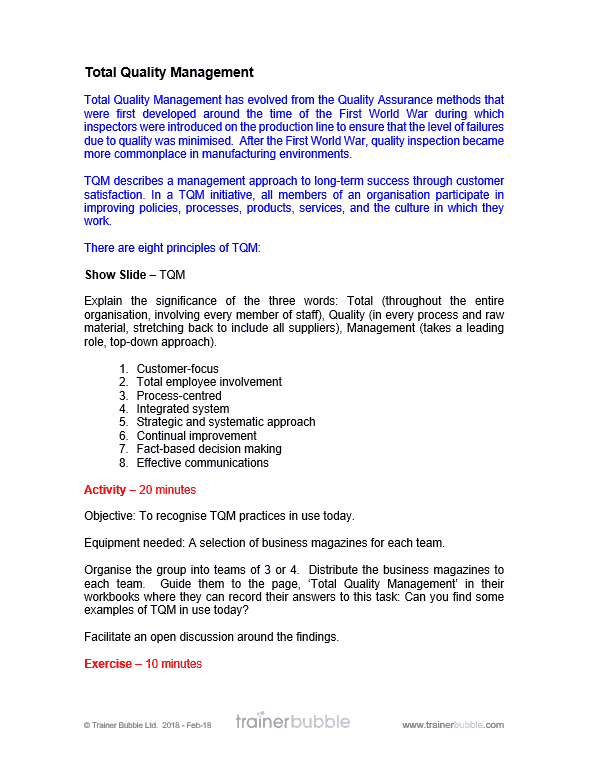 Total Quality Management – Exploring the eight principles of TQM, comparing it to the participants own organisational practices and establishing how the key principles can be applied. Quality Assurance and Control – Understanding the concepts of quality assurance and control and watching a YouTube video that helps explain Quality Management Systems that use the principles and then finally identifying what aspects of Quality Assurance and Control are in place in the participants’ places of work. 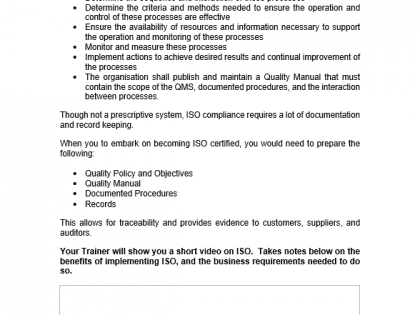 ISO 9001 – Establishing the requirements of a quality management system that adheres to the ISO 9001 standards. 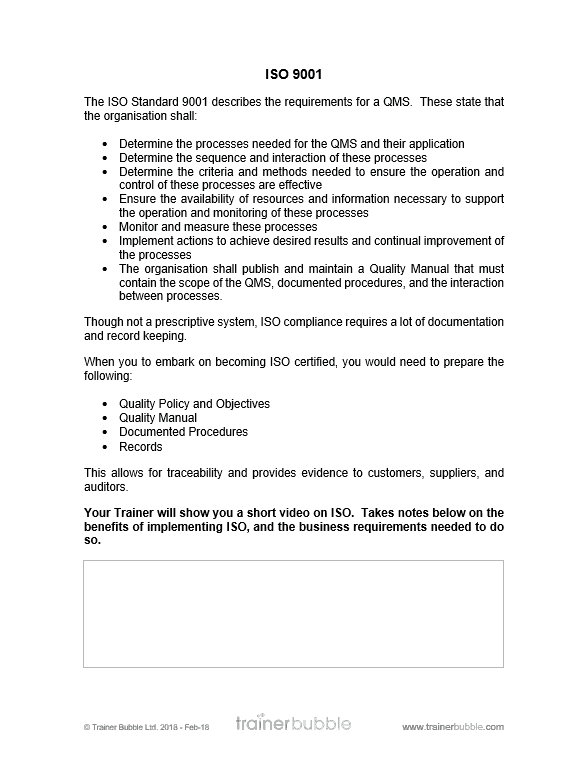 Includes a YouTube video that summarises the impact ISO9001 standards have had. Putting Quality Management to Work – A fun activity that explores all of the quality management aspects covered so far and helps establish that participants can apply the principles to a given scenario. 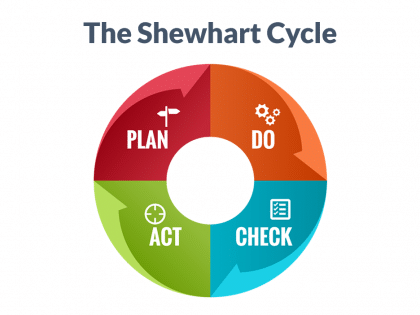 Quality Measurement and Improvement – Using the Shewhart Cycle (Plan, Do, Check, Act) to help measure and improve quality. Exploring the difference between continuous improvement and continual improvement and how it can be used to define how we make improvements. 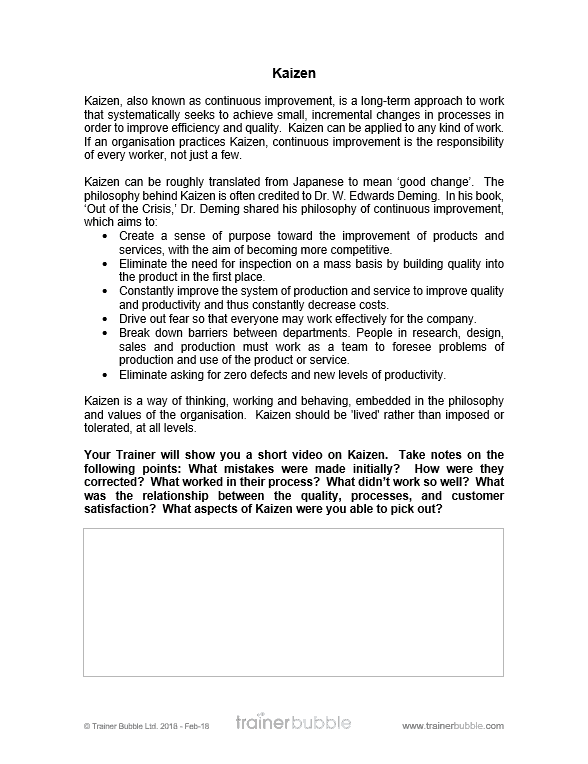 Kaizen – Another approach to continuous improvement. 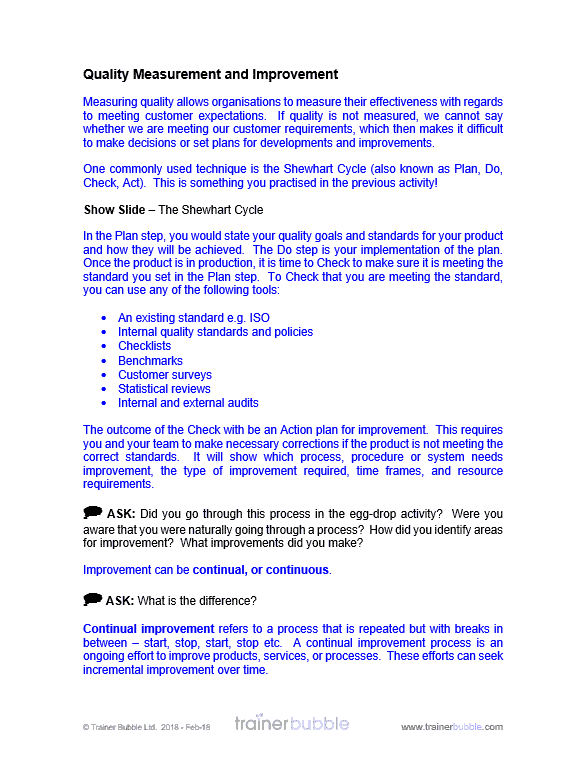 Understanding this approach to quality management and its key concepts. 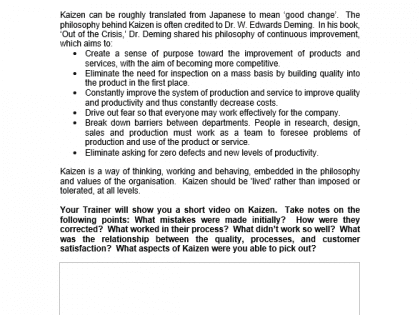 Reviewing a YouTube video that details Kaizen in practice and reviewing the concept based on these outputs. Quality Management Tools and Techniques – Identifying and describing the most commonly used tools and techniques for quality management and ensuring participants can appreciate how they are applied. 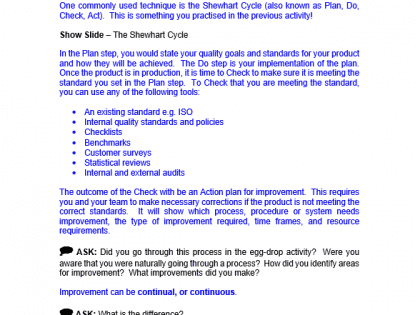 Quality Management Case Study – Exploring quality management via a case study that explores the main concepts and allows participants to apply their own thinking to a scenario. 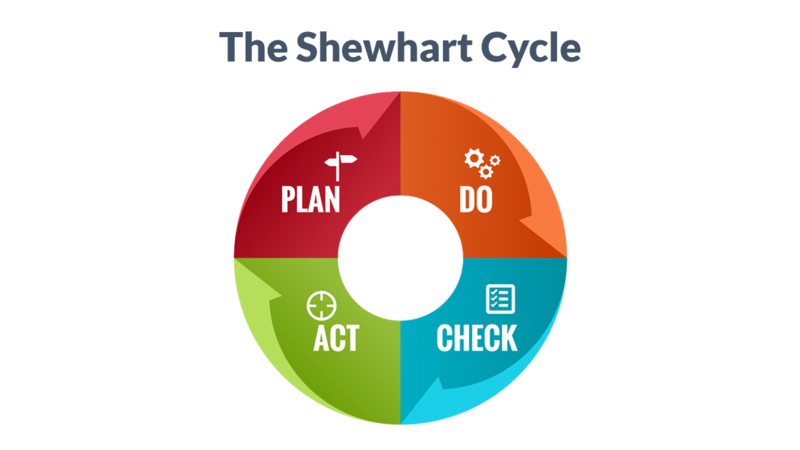 Summary and Action Planning – A final activity that closes the training in an engaging way and ensures participants leave with some key actions for workplace improvement. 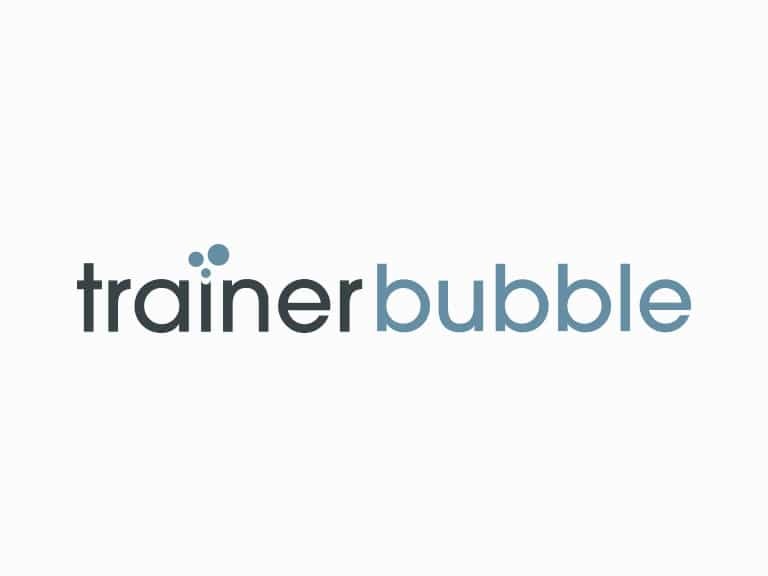 As with all Trainer Bubble training course materials, this training course is interactive and engaging with regular activities and exercises.